Tea grown on the steep slopes of Darjeeling hills, connoisseurs swear, is unlike anywhere else in the world. Epicures use a plethora of adjectives to describe the “champagne of teas”: brisk, flowery, round, mellow and sparkling. Brewed properly, the Darjeeling tea leaves yield a thin-bodied, light-coloured liquor with a floral aroma and a musky spiciness leading tea connoisseurs to label a variety of the tea as muscatel. At the luxury Harrod’s store in London a muscatel retails at over Rs 9,000 a kg. The famed Makaibari gardens sell what the estate calls “the world’s most expensive tea—Silver Tips Imperial. Reputed to “cull one to celestial slumber”, it is priced at US $20 (Rs 900) for a 50 gm pack. On February 27, this year, Gorkha Janmukti Morcha’s (GJM) plantation labour union—the only union in the hills—put a spanner in the wheels of this high-end business. It placed an embargo on dispatches of the premium first harvest of the gardens, called the “first flush”. The union demanded a steep raise in the daily wages of tea labourers: from Rs 67 to Rs 120. After a month-long standoff, the garden owners bowed to the politically strong labour union. The wages were increased to Rs 90. Behind the one-time jump of Rs 23— compared to a pitiful raise of Rs 14 in the past 11 years—is a story of Darjeeling’s ethnic politics getting intertwined with labour issues in the tea gardens. The hilly district in north West Bengal has witnessed much political and economic upheaval in the past three decades. The violent movement for a Gorkha state, Gorkhaland, in the 1980s led to the creation of an autonomous body to administer Darjeeling district, the Gorkha Hill Council. Barely had political trouble abated, the tea gardens were overtaken by an economic crisis with tea exports plummeting after the collapse of the Soviet Union. The turnaround came in 2004 after Darjeeling tea acquired a Geographical Indication status (GI). A first for India, the status implied that the country’s tea board would certify only the tea grown in the area as Darjeeling tea—much like wine can be produced and sold under the Champagne brand only if it originates in France’s Champagne district. Armed with the GI tag, a bunch of entrepreneurs orchestrated an organic makeover to cater to the discerning consumers of the US, Europe, UK and Japan. The marketing success of organic- fair-trade-Darjeeling tea did translate into premium prices, but it required a resurgence in identity politics for the predominantly Gorkha labourers to have a share in the pie. Prashant Tamang—ethnic Gorkha and a Kolkata police constable—was an underdog in the 2007 music reality show, Indian Idol. A wave of support from the Darjeeling hills turned the tide in Tamang’s favour. Bimal Gurung, a one-time protégé of the Gorkhaland movement leader Subhas Ghising, rode this surge of ethnic brotherhood to form the Gorkha Janmukti Morcha (GJM) that renewed the more-than-two-decade- long demand for statehood for 700,000 Gorkhas of Darjeeling district. For the GJM, the transfer would mean the power to effect two major changes. First, the council will be able to confer land rights on people of the district’s predominant ethnic group, Gorkhas. Constituting 80 per cent of the district’s population, most Gorkhas spend nearly all their lives in the tea estates. Since the estates are deemed government land leased to planters, the workers have no land titles. Secondly, the council can tighten its hold over the planters by increasing the hitherto nominal land rent tea estates pay for the lease. Tea cultivation in Darjeeling began in the 1840s after a colonial official experimented with tea seeds in his garden in what was then a sparsely populated hill resort for the affluent. Commercial plantations mushroomed in the next two decades. Plantations required workers to plant, tend, pluck and finally manufacture the tea—a labour-intensive process which continues till today. 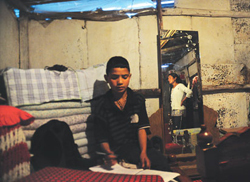 The steady supply of cheap labour came from across the border in Nepal. The turning point came in 1971 when Russia became the bulk importer of Indian tea. An assured market made the planters sacrifice quality for quantity. Chemical fertilisers and pesticides were used for the first time in tea estates to boost productivity. Unable to deal with the stress some gardens discontinued use of chemical fertilisers—simply to cut cost— while others were closed and finally abandoned. Within a decade several gardens became “organic by default”. The next big change came around 2000 when a handful of entrepreneurs bought a host of the “sick and abandoned gardens” and converted Darjeeling into a niche brand. Ashok Lohia of the Chamong group, for instance, bought 11 gardens between 2001 and 2004. “For the industry, the real challenge was to prevent misuse of the brand. The tea estates were certainly not benefiting,” he says. 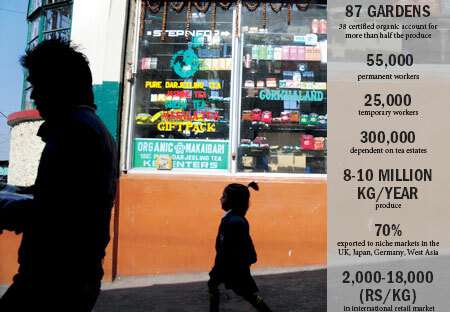 While Darjeeling produced barely 10 million kg in a year, world over an estimated 40 million kg was sold in its name. A painstaking campaign later, Darjeeling got the geographical indication status in 2004. Simultaneously, to cater to the discerning international consumer, gardens started an organic transition. Today 38 gardens, accounting for more than half of the tea grown in the region, are chemical-free (see ‘Organic certification and technology’). Drinking fine tea requires a fine etiquette. Not so if one is a tea-taster. He doesn’t sip, but takes the brew in with a loud slurp and spits it out. In that split second as the brew touches his upper palate the flavours and faults are screened. A hurried assistant notes down the qualities of the tea and the price it can fetch at auctions. But most Darjeeling gardens no longer depend on auctions to sell their best produce. “The auction scene has changed a lot in the past few years. In 2010 only 38 per cent of the total produce was sold through auctions, the rest was direct overseas sales. It is only small players who seek our help to market their produce,” says Samar Sircar, managing director of Contemporary Brokers at Kolkata. From the onset of spring as gardens open for harvest to the winter months when gardens shut, the colour, aroma and taste of Darjeeling tea changes. And so does the price. The first and second flush, harvested between February and April, are prime teas for which international buyers pay a premium. Tea estates earn 70 per cent of the revenues during this period. But prices remain a closely guarded secret. A senior member of the Darjeeling Tea Association says, “The planters play cards close to their chest. Not even managers of tea estates know the price the prime first or second flush tea is selling for.” The prices are not disclosed, presumably for two reasons. The planters do not want the workers to know lest they demand a share or another garden undercuts and poaches on private buyers in a fiercely competitive market. Retail prices are only indicative. Nathmulls, a well known retailer from Darjeeling, was selling the first flush tea from the 2010 season at prices between Rs 2,000 and Rs 15,000 a kg. 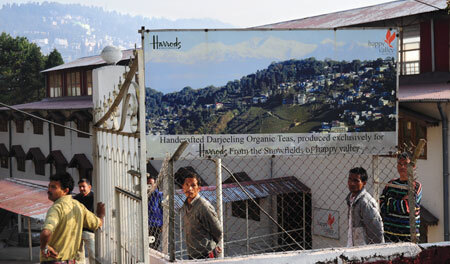 “Everyone says Darjeeling is selling at high prices abroad. But I have no idea how much the four kg of tea leaves I plucked today will sell for,” says Radha Thakuri, a plucker at the Phoobsering tea estate. “Shunne me aya hai ki pachhis hazaar me bik raha hai” (We have come to know the tea is selling for Rs 25,000 per kg),” adds Rakesh Sarki, a labourer at Happy Valley tea estate. “If the estates are earning so much is it wrong on our part to demand a fair deal? The planters say they pay for medical and housing, but look around and you will know the truth. At least we have the labour union fighting on our behalf,” Sarki adds. “For Darjeeling the survival model is through elimination of brokers and direct marketing. As for private sales (not through auction), rest assured it is not more than 25 per cent of the retail prices in international market. Besides, I don’t understand how workers are going to benefit if I reveal the prices,” says Ashok Lohia, owner of 13 gardens and the largest producer of Darjeeling tea. All tea estates are governed by the Plantation Labour Act, 1951, which lays down the welfare guidelines for workers. According to the Act, estates are required to provide workers with “necessary housing accommodation” and “medical facilities as prescribed by the state government”. Tea estate managers and owners think the Plantation Labour Act has outlived its utility. Such benefits, they say, hurt the industry’s competitiveness. Beyond the recent wage hike, a temporary plucker still earns Rs 5.75 for every kg of tea leaves she plucks (in a day she can pluck no more than six kg). For Radha Thakuri, the success of brand Darjeeling meant precious little. Radha got married in the Phoobsering tea estate when she was 16. She turned a plucker 21 months later, when her husband passed away after a night of acute stomach pain. At her hovel of rusted tin sheets with holes all along the roof, she says, “Every time it snows or rains, I have to run with my 12-year-old son to benevolent neighbours for a place to pass the night.” Every time she falls ill, Radha has to climb three kilometres to report to the estate health centre. Otherwise, the 14 days of sick wages Radha is entitled to in a year won’t be counted. Radha voted for the Assembly elections on April 18. But she is more worried about her house than a separate state of Gorkhaland. It is one of the better article I have come across regarding Darjeeling Tea and its true character with respect to wages and prices of Darjeeling Tea. Just as the flavor of Darjeeling Tea is a mystery so are the prices with almost no plantation willing to share data. However I have always felt that the auction rates have been a benchmark and though I cant remember the data accurately it is somewhere between 225 to 270. The total average of the district on a best case if we double it in my opinion cannot cross 500. Also the daily wage rate in 1999 was Rs 38.80 Today it is 90. This does not include any form of social benefits like provident fund and gratuity and other benefits like housing and medical. Cost are going up, production is going down. They are plenty of challenges ahead for all the stakeholders. In my opinion the focus anyways should not be these. It should be increasing awareness finding concentrated markets with greater depth of reach. That alone can only take care of the problems. I feel for the workers though. They can do the least to solve the problems in the future and are the biggest stakeholders in the entire industry. Such is life. Rishi, thanks for your comments. I agree with you on the wages and secrecy regarding the prices, but auctions are no longer the benchmark for Darjeeling. Most tea estates are earning 70 percent of their revenues through private sales abroad, the average for which is between US$28 to US$60; the best teas are sold for 5 times this rate. As my article notes only 38 percent sold last year through domestic auctions. The wages have two components. A portion is paid through cash wages (which was Rs 67 until the recent raise to Rs 90- for the next three years) from which provident fund is deducted at the usual 12.5 percent. The rest, around Rs 60, is paid 'in-kind' through housing, medical and food rations. It is under this fringe benefits that gardens are lax. The estates are not spending the promised amounts though they are required to do so under the plantation labour act. True, the estates should sell their tea in newer markets, home or abroad, but with a degree of transparency. I agree that the production is down as the tea bushes are aging (average age: 85 years) and due to erratic rainfall. Organic certification costs money (Rs 1.5 lakh per year for 200 ha) and transition to organic methods causes a loss in productivity by upto 25 percent, especially during the initial years. But under such a scenario won't it make sense for the owners to transparently explain their situation to the workers? What sense does it make to keep the estate workers in the dark? The changing political scenario and the fundamental non-competitiveness of the major players will ensure that the carpet will get pulled under the planters feet. The ones to be hurt will be those who do their business 'clean and above the board'.... you just can't pay like that to the workers. One price fall and the region wll burn. However, I do sympathize with the labor. The managements have a lot to answer. Appreciate the human angle to the story, with the workers' problems and all. Then again the human condition is inherently tragic. But are the workers paid enough for doing their work is a completely different question and needs more study than you seem to have done. There is demand-supply balance, worker productivity and importantly profitability of the estates. Note that profitability has many other components other than selling price and labour wage per capita.